On Friday evening, the BBQ at work having been cancelled due to the inclement Scottish summer weather, Jane and I drove down to my hometown of Selkirk in the Scottish Borders for a flying, overnight visit. I’d not seen Mum since my final service at the end of April, which was strange because when I was living in Edinburgh it was quite easy to pop down to see her for an evening (45 miles door-to-door) and she frequently met me in Edinburgh for lunch as it is free for Mum to get the bus from the Borders up to Edinburgh. Mum still hasn’t seen our current house here in Cellardyke; she has seen the holiday cottage. 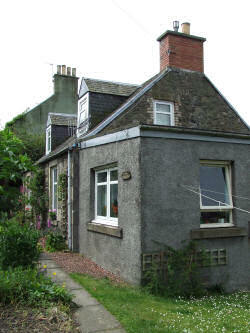 The photo above is of Kirkbank Cottage, where I grew up. We moved into that house when I was all of a few months old, and Mum (and, until 1998, Dad) and the family have been there ever since. It occurred to me for the first time this visit that the cottage’s name now only makes sense historically. Kirkbank Cottage is a cottage situated on a banking (hillside) by the kirk (church). But there is no kirk there now: it was demolished last year. It is very weird stepping out of the front door now. Where once there was a huge monolith of a sturdy, Church of Scotland building for worship, there is now sky. 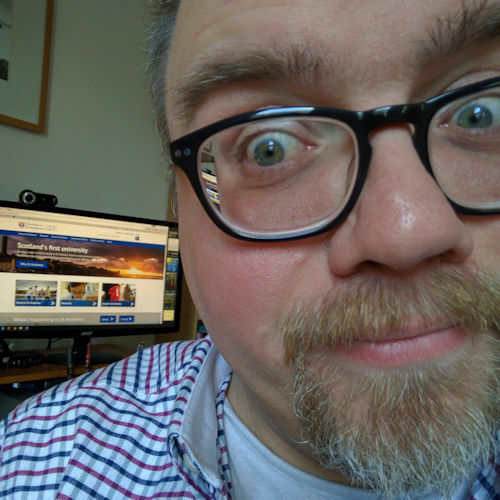 Here’s a little tale about Kirkbank Cottage (built in 1871, and extended in 1982), that I’ve been meaning to blog about for ages. At the start my fourth year at St Andrews (so, September 1992) I needed a passport photograph for a form at my halls of residence. I had a deadline of two weeks to get it done, and one one particular day during those 14 days I decided that that was the day. I knew where there was a passport photograph machine, and off I headed after breakfast; a quick detour on my way to college. When I got to the passport photo booth there were a couple of women in the queue in front of me: a middle-aged woman wearing a bright red coat, and an older woman, whom I presumed to be the red coated lady’s mother. I joined the queue and waited for them to finish. “Would you like me to look after your bag?” the woman in red asked me, as I stepped towards the booth. Hmmm, I thought, what if she wants to steal it? “Okay,” I said handing it over to her, my confidence in humanity obviously overruling any scepticism that I might have had about kleptomaniac women wearing bright red overcoats. And sure enough when I stepped out of the booth my bag and two women were still standing there. I’m sure my photographs, however, came out with me looking down nervously to my left. I stepped out of the photo booth and we all waited for our photographs to develop. “Are you a student here?” the woman in red asked me. “Yes,” I said. Because I was. “What are you studying?” she asked. When I said that I did, the woman in red told me that he was a neighbour of hers. What a small world. Little did I know that it was just about to get smaller. There was a pause in the conversation. The younger woman spoke again. “Where are you from?” she asked. “Selkirk,” said I. For it was true. The stranger chuckled, and there was another pause. “Where about in Selkirk did you live,” I asked her, this time taking the initiative. “Kirkbank Cottage, 35 Forest Road,” she replied. “That’s my house!” I exclaimed. “Are Keith and Rosalie Saunders your parents?” she asked me. “Then you must have been the little baby that moved in when we moved out,” she said. It turns out then that this lady — this stranger in a bright red coat, standing in front of me at a photo booth on a random day in St Andrews — sold her house to my parents in 1972. I would never have met her had I not moved back into halls of residence for my fourth year; had I not needed a passport photograph; had I not decided to get my photograph taken that day, at that time; and had I not got talking to her while we were waiting. Isn’t life great when you’re paying attention! That has to have been my most Twilight Zone moment to date. hrm, isn’t cleptomaniac spelt with a ‘k’ not a ‘c’? that’s at the beginning, not the end! google seems to think so too. so it’s not just me! bah. *squints at watch* i hate insomnia. Previous Previous post: No pressure!